LIMITED TIME OFFER! NOT IN STORES! Snip the herbs you need quickly, neatly and right where you want with our herb scissors. 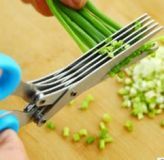 The unusual blade design features a set of five, sharp stainless steel blades that allow you to cut, chop or mince herbs directly into a pan or over a plate for garnishing.